Seattle is well known for its excellent seafood, especially oysters. The brackish water in complex estuaries in the Pacific Northwest region, including Puget Sound and along the coast of British Columbia, forms a perfect oyster habitat and breeding ground. 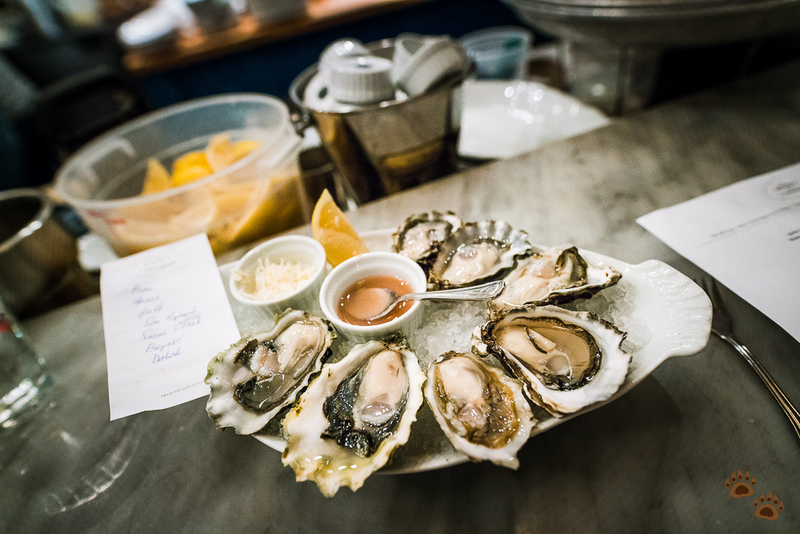 When it come to tasting these local bivalve mollusk varieties in Seattle, there is no better place than the Walrus and the Carpenter! The Bears were in Seattle back in December last year. We were craving for good seafood so we decided to drop by the Walrus and the Carpenter again. That’s right! The Bears had been here before and we love it. 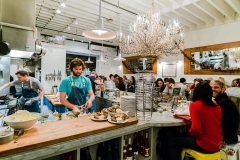 Chef Renee Erickson opened the Walrus and the Carpenter in 2010. 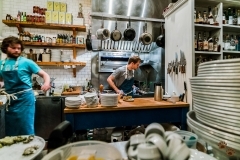 Since then, they received many accolades including Top 10 Seafood Restaurants in the US, Best Restaurants, Most Important Restaurants in America, and many more. 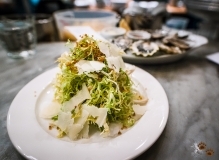 The oyster bar is named after a Lewis Carroll poem of the same name and located in the Kolstrand Building in Ballard neighborhood, only about 20 minutes drive from downtown Seattle. There are free street parking along Ballard Ave NW. Better yet, drive around onto Shilshole Ave NW, you will find a small parking lot and the entrance at the back. We arrived around 9:20pm and were seated promptly at the bar. Note though that you may have to wait for an hour or two if you come during peak hours. In that case, drop by the Barnacle Bar, also owned by Chef Erickson, across the hallway for a sip while you wait. 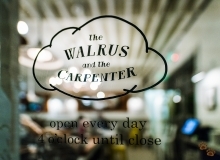 The Walrus and the Carpenter accepts walk-in only, no reservation. The dining room forms an L-shape with stools along the bar, high tables lining the wall and a small patio seating area. The centerpiece coral-like chandelier dominates the room. 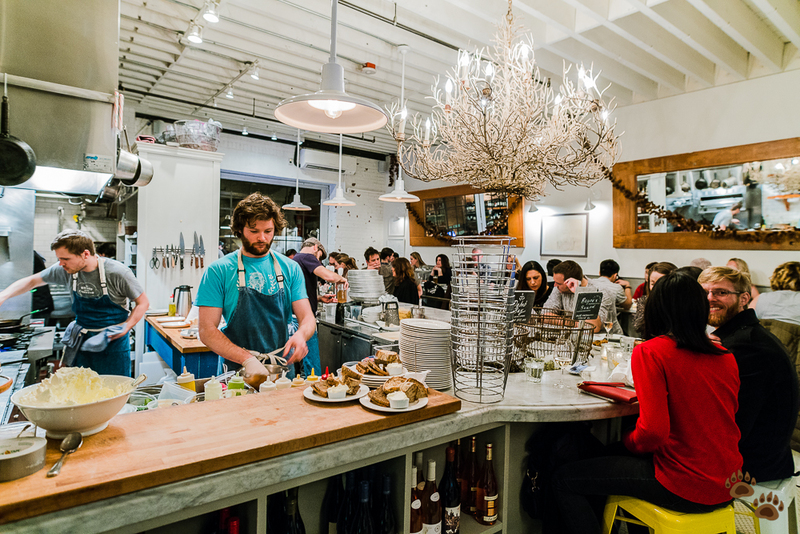 The bar seating affords us a full view of open kitchen as well as the oyster shucking, which can be pretty entertaining. The menu lists oysters available on that day, mainly from the local bays and inlets, and sometimes from Oregon and British Columbia. Papa Bears ordered one of each to sample. 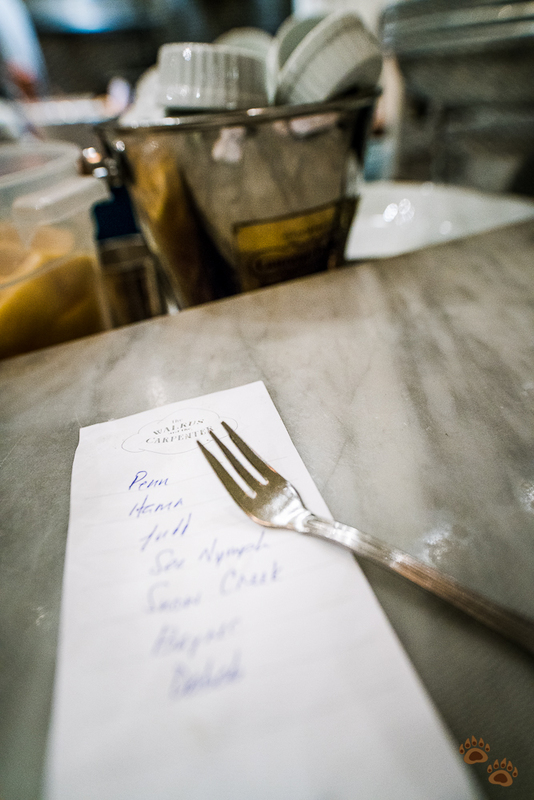 The staff handed us a cheat sheet listing the oysters we ordered from the mildest at the top to the most briny. The Bears watched the oyster shucker performed his routine with precision while waiting. Within a few minutes, we had an oyster plate in front of us. The oysters were arranged in the same order as the cheat sheet, the mildest to the briniest, starting from the lemon wedge in clockwise direction accompanied by a mignonette and freshly grated horseradish. Mama Bear does not eat any oyster, so she just watched Papa Bear slurping the oyster from its shell away. Since oysters are filter feeders, the water they feed in play the main role in how the oyster from that region taste. So even though most of the oysters were from the local area, Papa Bear could notice the subtleties in each variety. Overall they were super fresh, succulent and extremely delicious. We tried the frisee salad from the “Garden” section of the menu. 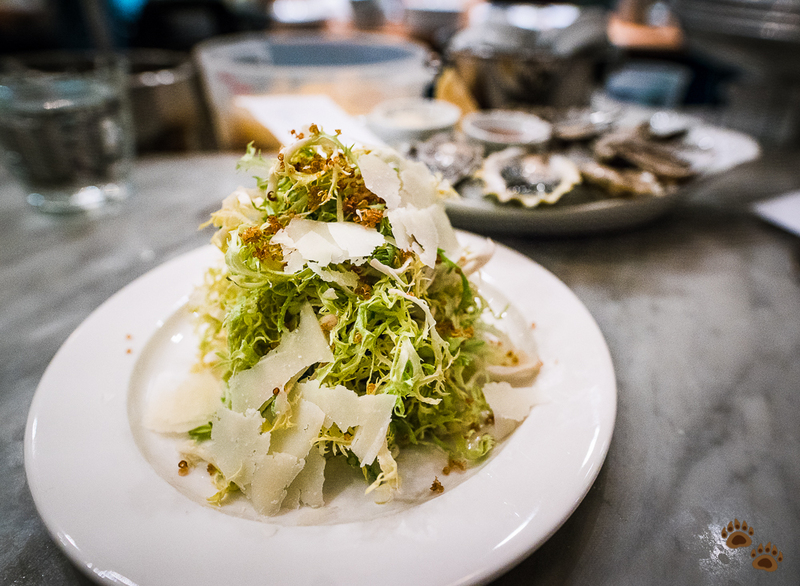 The frisee mound piled high along with thinly shaved pecorino cheese and crispy quinoa. The Bears felt that the dish was overpowered by the anchovy cream though. Next up, also from the “Garden” section, was the roasted beets. 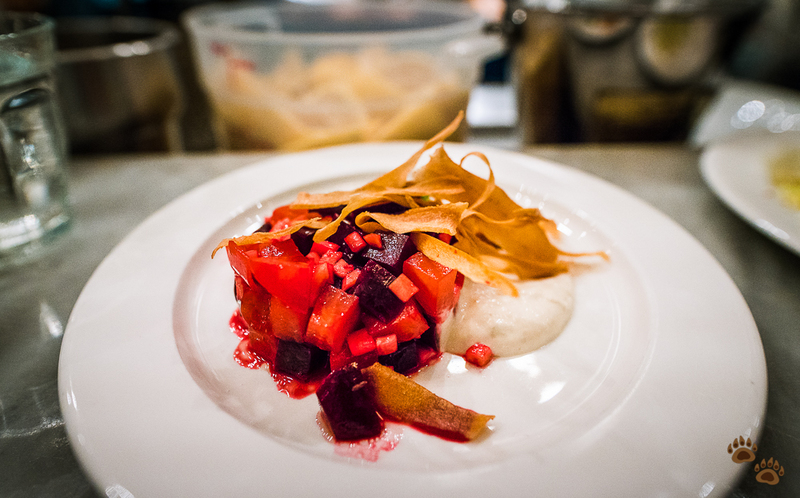 The sweetness from bright red beets paired very well with celery root and tonnato, with crispiness from parsnip chips. 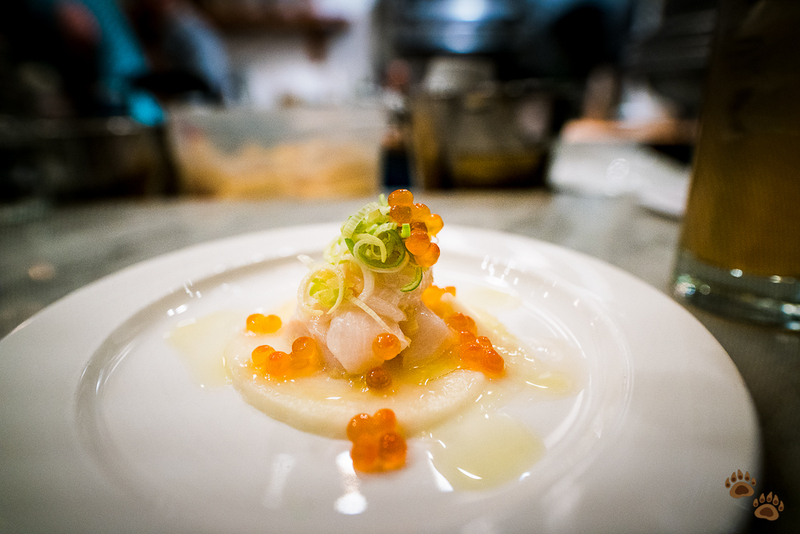 The next dish to hit our paws were the scallop crudo. The scallop was so fresh and sweet, coupled with salty pop from ikura (salmon roe), tangy preserved lemon and creamy parsnip puree. 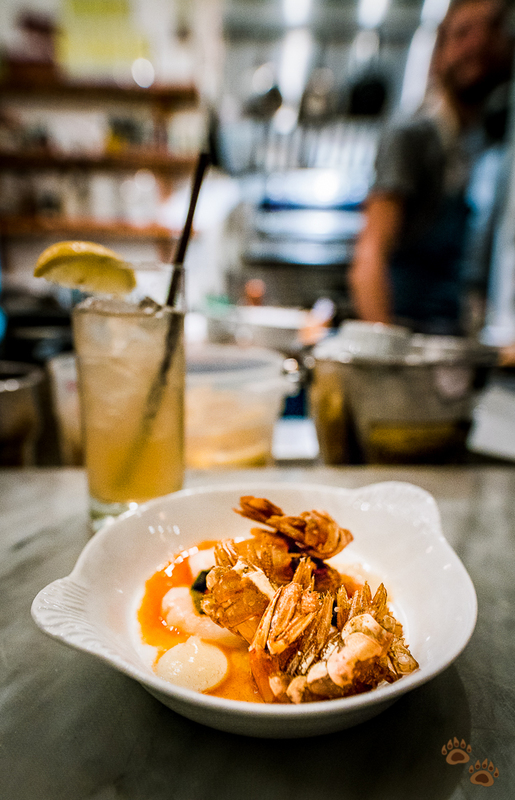 After a short wait, the waitress brought us spot prawn crudo topped with its own deep-fried shells. The Asian twist on this plate came from dashi broth and kimchi. 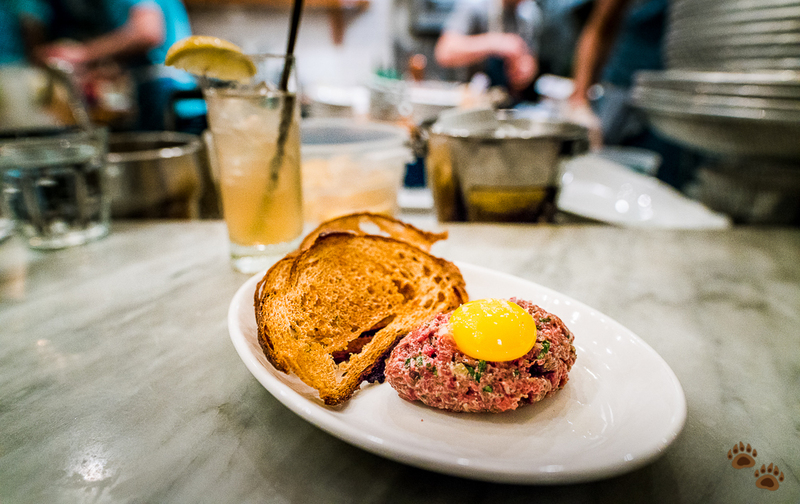 The final savory dish for us was the steak tartare – one of their signature dishes that we also ordered in our last visit. The perfectly seasoned tartare ball was topped with a bright orange egg yolk and salt crystals. It was fresh and super delicious! We ordered the maple bread pudding to finish off the night. Nothing so special about this one. We even thought the espresso butter sauce was a bit burnt. The final bill came in at exactly $100 for both of us for the food. The restaurant automatically added 20% for service charges on top of this. The Walrus and the Carpenter is truly one of the best places for seafood experience in Seattle. You can’t go wrong with the oyster selection here. You will be surprised by the subtle taste differences from each local varieties. The restaurant delivers the best and fresh seafood the Pacific Northwest region has to offer. Services is great and the staffs are knowledgeable and friendly; and that are to be expected considering 20% service charges were automatically included in the bill. The drawback is that they are extremely busy and accept walk-in only, and thus the long wait associated with it. Come in early to avoid the line or very late, but then risking some of the dishes sold out. The dining area itself is not as spacious and not really suitable for a big group – we say 4 at most per group. 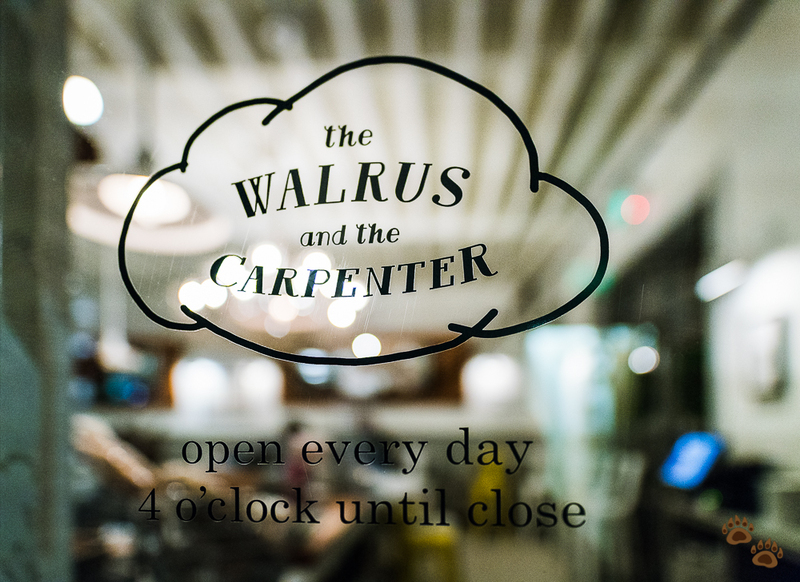 If you are oyster lovers, make sure to visit the Walrus and the Carpenter during Happy Hour (Mon-Thu, 4pm-6pm). The oysters are half off between 4 pm and 5 pm, and 25% off until 6 pm! 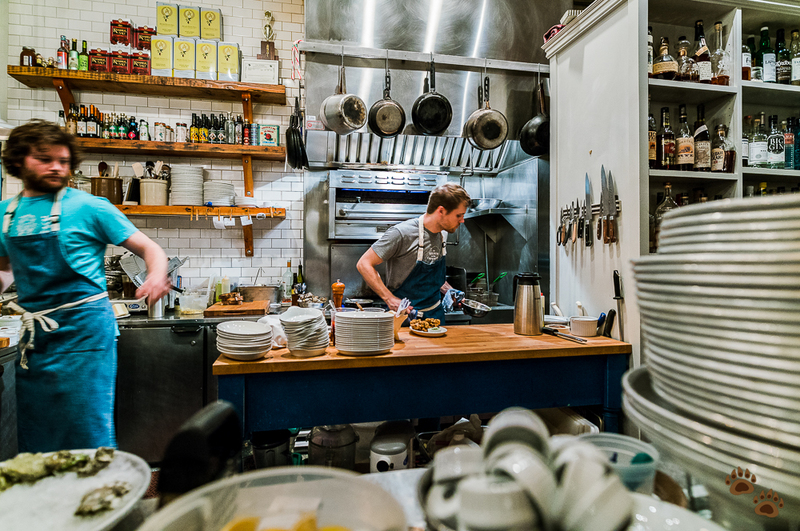 All photos in this post were taken handheld with Sony a7R II camera and Sigma 20mm f/1.4 DG HSM Art lens under normal restaurant lighting setting. 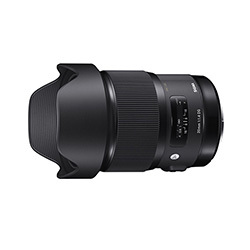 Click to read Papa Bear’s review on this awesome lens!